A night full of big moments. The SmackDown entourage stooped over in Carbondale, Illinois for a routine live show which had all the top stars in attendance. The women were unsurprisingly absent as they were required to be present on Raw for the historic announcement regarding the first all women's PPV, WWE Evolution. The Carbondale card featured seven matches in total with AJ Styles headlining the show in a title match against the man he is most-likely set to face at SummerSlam. A popular tag team showed signs of a forthcoming split while Daniel Bryan and Miz finally faced each other in a match long time coming. 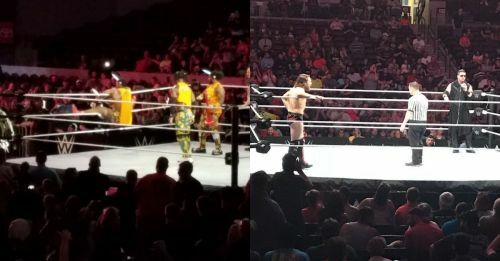 Two experienced tag teams kicking off a house show was a smart decision to make as the two sets of former Tag Team Champions put on a solid match begin the proceedings. All the superstars were quite over with the fans in a match that saw New Day come out triumphant against Sheamus and Cesaro.